Weather often contributes to motor vehicle accidents. Snow, rain and other factors that compromise drivers' vision can make driving hazardous, but there's a dark side to sunny skies as well. Glare from the sun can compromise drivers' vision and lead to driving mishaps, regardless of drivers' experience or skill level. The sun can pack a powerful punch any time during the day, but can be especially hazardous in the early morning sunrise and late-afternoon sunset. A 2017 study published in the journal Medicine titled, "Life-threatening motor vehicle crashes in bright sunlight" looked at the risks posed by bright sunlight. Researchers found that the risk of a life-threatening crash was 16 percent higher during bright sunlight than during normal weather. Researchers concluded that bright sunlight may create visual illusions that lead to driver error, including poor distance judgment. Plentiful sunlight is often a hallmark of spring and summer, but sun-blindness is a real concern for drivers. As anyone who has turned into blazing sun only to discover their windshield has been rendered opaque by sun glare can attest, driving on sunny days can be challenging. Unfortunately, the sun might create substantial glare during rush hour, making driving during these times more dangerous and accidents more likely. While there might be no way to prevent glare, drivers can take steps to make driving safer during times of day when glare is prevalent. · Make sure the windshield is clean. Water marks, dead insects, cracks, and road grime can make it even harder to see out of the windshield when the sun is blazing. Clean windshields regularly, and don't wait until you're head-on into the sun to engage the windshield washer spray. Doing so may only further compromise visibility. · Observe speed limits. When glare is present, slow down and keep more space between your vehicle and the vehicle in front of you. If someone in front of you needs to brake suddenly, the greater distance between vehicles can give you more time to react and avoid accidents. · Change your route. Try changing your commute so you're not driving head-on into eastern sun in the morning and western sun in the afternoon. · Invest in new sunglasses. Special lenses that mitigate glare, UV rays and blue light can make it easier for drivers to handle glare when behind the wheel. · Make sure the visor is functioning. Sun visors are there for a reason. Use it to the best of your ability, angling as needed. · Pull over. If the glare is especially bad, Plymouth Rock Assurance suggests playing it safe and pulling over until the sun rises or sets. You also may want to change your driving time to avoid the glare. Motor vehicle accidents can happen on bright, sunny days. 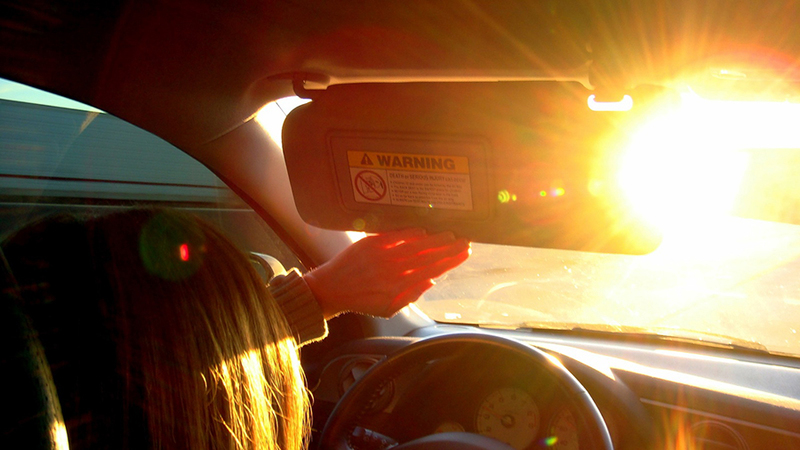 Glare can compromise drivers' visibility, and drivers may need to take steps to protect their vision on sunny days.